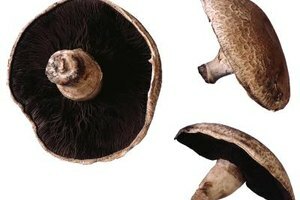 Portobello mushrooms are actually just mature crimini mushrooms. Portobello mushrooms are widely used as a patty substitute on veggie burgers thanks to their intense flavor and meaty texture. But the large, wide mushroom caps can actually be prepared as a low-carb bun for any kind of burger. You can cook the mushrooms right alongside your burgers, whether you're grilling them, pan-frying them or cooking them in the oven. Break the stem off of each mushroom and wipe clean with a moist paper towel. Brush on both sides with oil, then season lightly with salt and pepper. Place the mushrooms on a foil-lined baking sheet with, then transfer to a 400-degree Fahrenheit oven. Roast until lightly browned, flipping once during cooking, about eight minutes on each side. Grill the mushrooms over high heat, flipping once, until they are nicely browned, about four minutes on each side. Heat a large, oiled skillet on medium-high. Place the mushrooms in the skillet, making sure not to overcrowd the pan. If you try to cook too many at once, they will steam instead of searing. Season with salt and pepper and cook until golden brown on one side, about three to four minutes. Flip the mushrooms, season again with salt and pepper and cook for another three to four minutes.